There’s already a strong connection between LSU and the AFL’s New Orleans Voodoo. But this year, the bond got a little stronger. The 2014 Voodoo feature 3 former Tigers from LSU’s last two National Championship teams: Favorite, Wide Receiver/Return Specialist Skyler Green, and now Quarterback Ryan Perrilloux. Saturday marked Perrilloux’s first start in the state of Louisiana in over 6 years, back when he was still an LSU Tiger. But even after all this time, Perrilloux appreciated the LSU faithful making their presence felt at the Voodoo’s 37-26 loss to the Cleveland Gladiators. 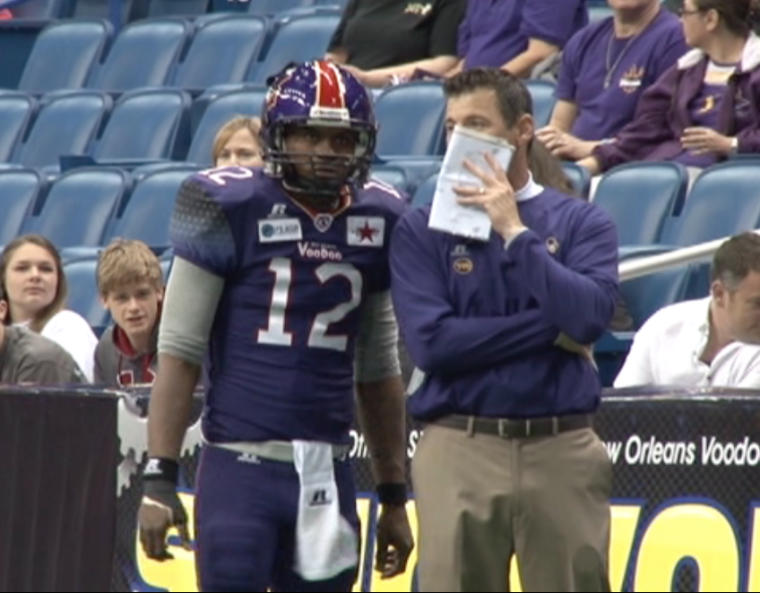 New Orleans Voodoo and former LSU QB Ryan Perrilloux receives instruction from Voodoo Head Coach Pat O’Hara during a game at the Smoothie King Center in New Orleans. Perrilloux’s Voodoo home debut had mixed results, as he threw as many interceptions (3) as touchdowns in the loss. But the quarterback says he’s just happy to be back home. “It feels good, being in front of my family and friends, all my supporting cast from high school and college,” Perrilloux said. The 3 former Tigers may have traded their purple and gold for purple and red. But Favorite hopes the success they enjoyed at LSU will start to manifest with the Voodoo.